The causes of dog bloody eyes have to be categorized. These categories include etiological factors (factors which cause a dog eye disease) such as trauma, infections, pressure eye features and vascular supply, various ophthalmic conditions and several systemic diseases. Most of cases in which a dog eye appears filled with blood are caused by blunt injuries or trauma, accidents, penetrating wounds etc. over the the surface of the eye, which has rich supply of blood capillaries in which the blood pressure is noted as higher as compared to other parts of body. Similarly, severe uveitis or inflammation of the iris, ciliary body and choroid tissues also causes the escape of blood from the vessels at rear of the eye surface. 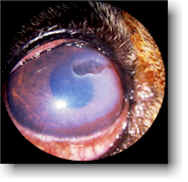 This causes blood to fill over the surface of dog eye. Certain systemic diseases, such as tick-borne infections, leukemia, systemic hypertension and blood clotting disorders are other causes of an eye filled with blood in dogs. Similarly, some systemic ophthalmic conditions, such as retinal detachment (retinal vessel rupture), post cataract surgery wounds, chronic glaucoma and a blockage of any kind in any part of the dog eye may cause the escape of blood and its accumulation at the front chamber of the eye. In complicated cases, such as dog eyes with metastatic tumors and benign tumors as well (not cancerous),the blood vessels may become fragile as the benign tumor puts pressure on the vascular system, due to which the dog eye surface may get filled with blood. Since there are various causes of canine hyphema, therefore, a spectrum of clinical symptoms can be expressed by the affected dog. Specific symptoms solely depend upon the underlying condition, but there are certain general or common symptoms noted in every case where there are dog bloody eyes. An affected dog will appear with pink to dark reddish eye surface, which represents the severity of the dog eye condition. In mild cases a small amount of blood will get mixed with the natural ophthalmic fluid on the surface of the eye. This type of dog eye problem will appear light pink to reddish in color, with some dog eye pain and discomfort. In severe cases or due to serious underlying causes, either the entire eye surface is covered with a dark red pattern or the capillaries of the white part of the dog eye surface are clearly lined. 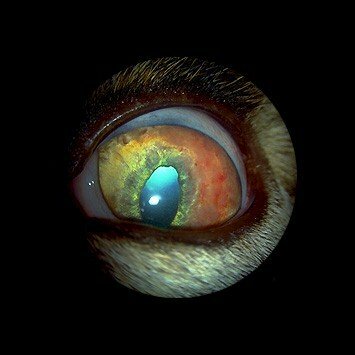 A dog with a clear lining of the capillaries represents a possible cause such as pressure or underlying systemic disease, but if the surface is fully covered with red spectrum, it represents either a severe injury or an underlying ophthalmic condition in the surrounding canine eye features (eyelids etc.). 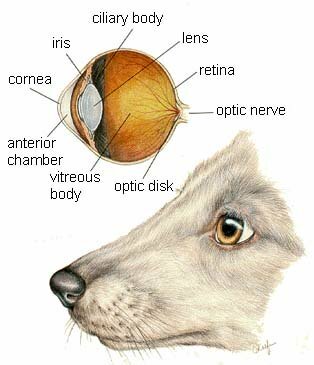 The history and detailed ophthalmic and systemic physical examination of the canine eyes are the initial steps towards reaching a diagnosis. A dog's history of any poison intake, medications currently being administered, the onset of any condition and any other recent systemic diseases are helpful in reaching a diagnosis. Similarly, a detailed ophthalmic examination includes the detection of any defects in the interior eye with the help of magnification, dilation and any supportive means. Similarly, it should also be determined through examination whether the blood filling the dog eye is only restricted to the surface or the blood is accumulated in other parts of the eye as well. Clinical approaches can help in identifying the possible cause of the dog eye filled with blood condition, but confirmation can only be made through laboratory tests, selected on the basis of the clinical canine eye examination and history. Canine uveitis is a condition which refers to inflammation in the middle layer of the surface of the eye. On basis of the clinical examination, a veterinarian may suggest some detailed laboratory tests to get the the exact cause of the dog eye filled with blood condition. These tests may include a complete blood count, platelet count, serum biochemistry, detection of blood clotting ability, urinalysis, and X-Rays of any part of the chest and abdomen, and ocular ultra-sonography. Veterinarians believe that a dog eye filled with blood should be treated as a medical emergency, since it rapidly affects the features and functioning of the eye. Therefore, initial supportive and symptomatic treatment should be initiated during the diagnosis phase of treatment, with the underlying cause treated specifically only after reaching a duly confirmed diagnosis. Symptomatically, different drugs in form of ophthalmic solutions, creams, ointments and oral preparations are administered. These drugs may be anti-inflammatory drugs, corticosteroids, pupil dilators and supplements/therapeutics for supporting canine eye blood coagulation (clotting). Anti-inflammatory drugs such as aspirin and carpofren are prohibited for dogs with blood filled eyes, since these drugs affect the clotting capacity of the blood. At home, a dog should be restricted to a safe room and should not be allowed to rub/scratch the eyes. Also, the dog should not be allowed to roam unattended when outdoors, since such dogs may have partial or complete blindness. Along with specific dog eye treatment, which may persist for weeks to months, supportive ophthalmic and general blood supplements are highly recommended. These include natural remedies such as Eye Heal which can help to sooth the eye and remedies that can help to maintain normal blood circulation such as Heart and Circulation Tonic.